On May 22, 2018, Sepsis Alliance launched the Sepsis Coordinator Network (SCN), a first of its kind online network that provides healthcare professionals with evidence-based sepsis best practices and resources to improve sepsis outcomes and save lives. The Sepsis Coordinator Network was developed by an advisory committee of nursing leaders with critical experience developing and implementing lifesaving sepsis protocols and working with septic patients. We had a chance to chat with SCN Advisory Committee Member Angela Craig, a Clinical Nurse Specialist for over 20 years, about her personal journey improving sepsis outcomes and developing the Sepsis Coordinator Network. Angela, you chair the Sepsis Team at Cookeville Regional Medical Center, which is the first hospital in Tennessee to receive sepsis certification through the Joint Commission. Can you tell us what sepsis certification means for the hospital and its patients? Yes – I believe receiving sepsis certification has increased quality of care for our sepsis patient population. Being certified helps us stay focused on sepsis and we are constantly working to try to benefit the patients and decrease variability in care in hopes we do the right thing as often as humanly possible. I believe certification also promotes achievement to our marketplace. You are a leader and expert in sepsis treatment and management, did you make a conscience decision to dedicate your career to improving sepsis outcomes? If not, how did you come to your current position? I am often referred to as the “Sepsis Queen” at the hospital. This love I have for improving sepsis outcomes has really evolved over time. In another hospital, earlier in my career, I worked with the heart failure population and helped my hospital become disease specific certified for that. As I became familiar – and ok maybe a little obsessed – with the Sepsis Guidelines and began implementing them at our hospital and then saw how quickly these interventions worked, it energized me. I want to give a shout out to the awesome nurses and Sepsis Team at Cookeville Regional Medical Center who take this initiative seriously and do a great job! It takes a team to be successful with this sepsis population. This past year, you’ve worked with Sepsis Alliance and a team of nurses, who are leaders in the field of sepsis, to develop the Sepsis Coordinator Network. Can you tell us a little bit about how and why you got involved and what the process has been like? I was invited to join a team of absolutely amazing and intelligent people who I feel blessed to call my colleagues. They are so knowledgeable in sepsis treatment and we are able to learn from each other and share experiences. The process has been awesome. We have had multiple conference calls, responsibilities, projects and we are all doing this because we want to help others with similar responsibilities have it easier than we did. It’s like paying it forward – we want to help those behind us so they don’t have such a tough time implementing a successful sepsis program at their hospital. What do you hope the Sepsis Coordinator Network will accomplish? I think the mission statement really spells it out: to provide sepsis best-practice resources and guidance to sepsis coordinators and all health professionals across the country. Our online network supports ongoing communication, education and network building among health professionals passionate about improved sepsis care. How do you think the Sepsis Coordinator Network can help healthcare professionals improve their practice? I think this network can help improve practice in many ways. First you will be able to join people across the country who are working on sepsis in their area. You can ask questions, ask for help, and find links to frequently asked questions which are loaded with evidenced-based information. All of this information, and it’s for free! That is so exciting and helpful. You recently gave a presentation at NTI what subject matter did you cover? I spoke with two amazing colleagues and friends, Kathleen Vollman and Pat Posa, and we discussed ways you can implement a successful sepsis program at your hospital and also gave suggestions for outside of the walls of the hospital with EMS, nursing homes etc. We discussed data that supports the implementation of a sepsis program and why this is a must for every hospital. We discussed how we can decrease mortality with this patient population. I also am doing some booth talks at the Edwards Lifesciences booth. The topics there will be Hot Topics in Sepsis: Where are We Today and From Good to Great, Driving Improved Sepsis Care at your Hospital. Do you have any parting thoughts you’d like to share? 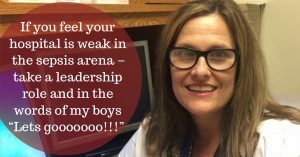 If you feel your hospital is weak in the sepsis arena – take a leadership role and in the words of my boys “Lets gooooooo!! !” There is no time to wait. There are many people dying of sepsis related events daily and we want to make a difference in their lives. I am grateful my hospital has embraced the sepsis initiative.